iOS 10.3.1 jailbreak by Pangu for 64-bit devices maybe coming soon. Here’s a guide on how to go about preparing your iPhone or iPad device for it the right way. With an iOS 10.3.1 jailbreak being teased by Pangu team, it’s definitely time to start thinking about going through the process of priming the device to be ready for it whenever it drops. Jailbreaking is fun and whimsical, but it’s also a serious business which can cause significant problems if something goes wrong. And while the rumored next week release of the said jailbreak, is well still a rumor as far as ETAs go, there’s no doubt now that a jailbreak for iOS 10.3.1 does exist even though it’s in private right now, so it is important to prepare in advance so that you are ready to go with it as, when, and if, it drops. Follow our guide below to preparing your device the right way to ensure you don’t fall foul of any issues. This one is really a no-brainer, and in all honesty should be something that is done on a frequent basis regardless of whether or not you are putting the device through a process like a jailbreak. Connecting the device to iTunes and performing a full backup will ensure that all of the important information is securely stored and can be restored back to the device if needed. When a jailbreak solution is released it’s not expected that things will go wrong, but if they do then it’s good practice to be prepared. iOS 10.3.1 is still the latest signed firmware version available for all general consumers. But with iOS 10.3.2 on the way, you may want to upgrade to it now if you are sitting on a firmware such as iOS 10.2.1 which doesn’t have any public jailbreak available for it. 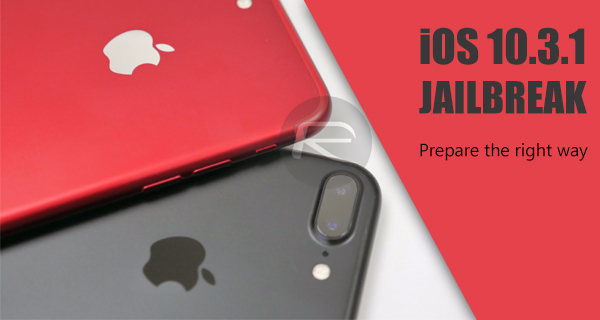 But if you are on a jailbroken firmware such as iOS 10.2 or below, we suggest waiting for the new iOS 10.3.1 jailbreak to actually arrive before updating your already jailbroken device to the latest firmware version. You can find info on how to update to iOS 10.3.1 here: Download iOS 10.3.1 / 10.3 Final IPSW Links For iPhone And iPad. 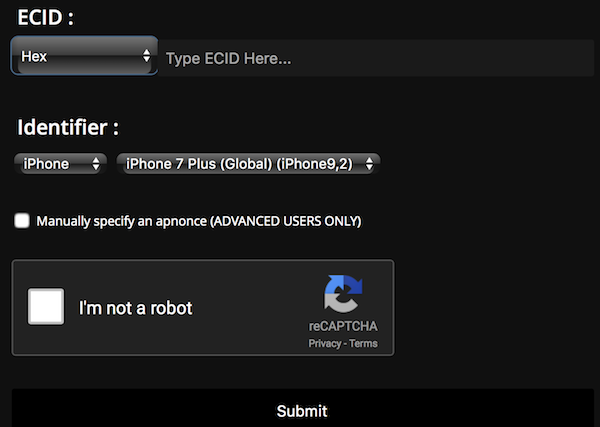 Step 1: First of all, you are going to need to have your ECID number from the device. With your iPhone connected to the computer, you can grab this number from iTunes in a hex format. Make sure you copy that number down to Pages, Word, a text editor, or similar. Step 2: With the ECID number copied, you will need to head over to the following URL to access TSS Saver: tsssaver.1conan.com. Step 3: About midway down the page there is a “Type ECID Here….” box. Copy and paste the ECID from Step 1 into that box. To the left of it, make sure you have Hex selected in the drop-down box to match the format in which the ECID was provided by iTunes. NOTE: If you have managed to get the ECID through another method, such as using UDID Calculator while jailbroken, then you will likely need to select Decimal in that drop-down to match the format it has been provided in. Step 4: Under the “Identifier” heading, choose the specific model phone that you are using. As an example, if this is an iPhone 7 Plus, then choose “iPhone” in the first drop-down, and “iPhone 7 Plus” in the second. If you have an iPhone 6s, iPhone 6s Plus, or iPhone SE, then the service needs a little more information. You will need the model number of the device, which you can get by installing the BMSSM app from the App Store, going to the System tab and copying it exactly as it appears, in the TSS Saver site. If you have an iPhone 7 or iPhone 7 Plus, then you will also need to know if the device is GSM or Global. With the device connected to iTunes, continually click on the UDID of the device multiple times until it shows the identifier of the iPhone 7. For iPhone 7, if the identifier is 9,1 then you have a Global device. If it is 9,3, then it is GSM. For iPhone 7 Plus, if it is 9,2 then it is Global. If it is 9,4 then it is GSM. Make sure the relevant info is selected in TSS Saver to reflect this. Step 5: If you have managed to follow all of that through, then simply click on Submit to create a link that will allow you to download and save those SHSH2 blobs. This part of the process is definitely the most frustrating for jailbreak fans. If there is a specific release date provided from the creators themselves, then there is actually something to look forward too and an end-goal in mind. However, as is the case with the iOS 10.3.1 jailbreak, it’s a case of “will they, won’t they” as we sit patiently and wait for its arrival with rumors floating around that it will be released next week. Pangu has historically done its utmost to benefit the jailbreak community, which has involved the release of multiple tools. We see no reason why this time will be any different, but we do all need to prime our devices and play the waiting game. iOS 10.3.2 Beta 4: Are There Any Changes Or New Features? Will it be tethered or finally untethered? most likely like the last pangu jailbreak, you will sign the app in settings and make it a 1 year certificate. If it’s not untethered is it really worth? Yeah ofc. Bc if it is a semi tether like last time than it will be fine. It took seconds to jailbreak, could do it from device and wouldn’t go away until restarted phone. Sometimes for me that would be weeks. But again just a few seconds and you’re right back where you were. I would prefer that over my non jailbreak now 1000x. yeah, I can’t seem to find it anywhere else too. anyone got a link? Anyone please have the Prometheus link? Just copy from itunes to telgram right? Yes, just copy the one from iTunes, that is already in hexadecimal. Can I jb iPad Pro on 10.0.2? “may be” in first line, not “maybe.” And yes, I am on 9.3.3, waiting patiently.